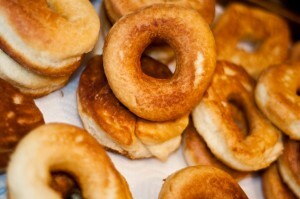 Home » Baking » Homemade Doughnuts! Doughnuts….little circles of heaven. I absolutely LOVE doughnuts…I mean really, they should probably be their own food group. (It’s really a good thing that the closest doughnut shop is about 20 minutes away…)However, I now have in my possession a recipe for amazingly good doughnuts. 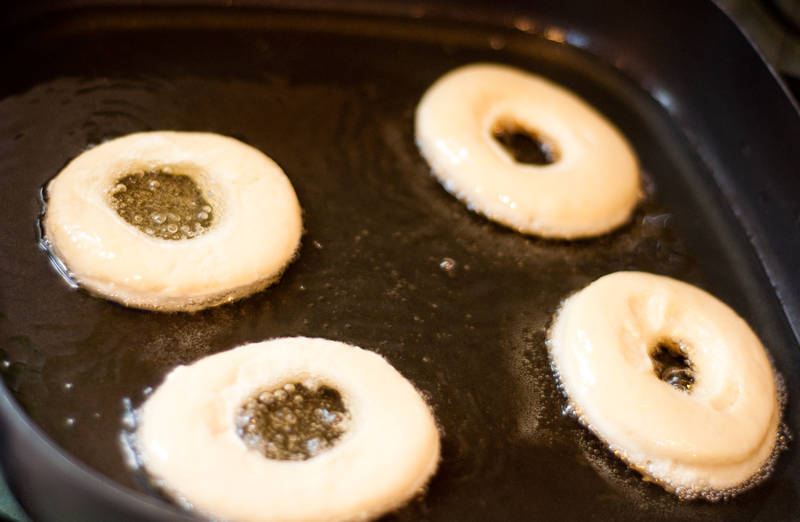 I have always wanted to try “real” homemade doughnuts, and think I found the perfect recipe! These doughnuts are deliciously addictive, and were actually VERY easy to make! I found the basic recipe in a Taste of Home magazine, and modified it just a bit. First beat the eggs for 5 minutes. They will be nice and bubbly, and look something like this. Now, slowly add in your sugar, a little bit at a time. Beat the eggs and sugar for several more minutes. 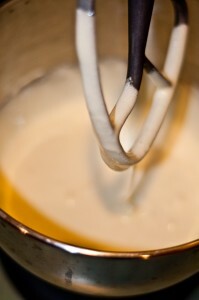 The mixture will become a very pale yellow (almost white) and will be thick and creamy. 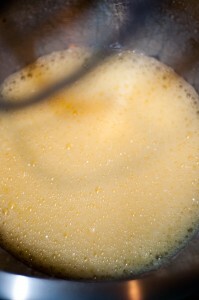 Now, add in the half and half, milk, vanilla, baking powder, baking soda, salt, and 2 cups of the flour. Mix until the batter is smooth. Then, add in the remaining flour until you have a nice soft dough. (It will still be a little bit sticky.) 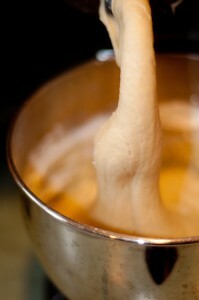 Use your dough hook and knead for about 5 minutes. 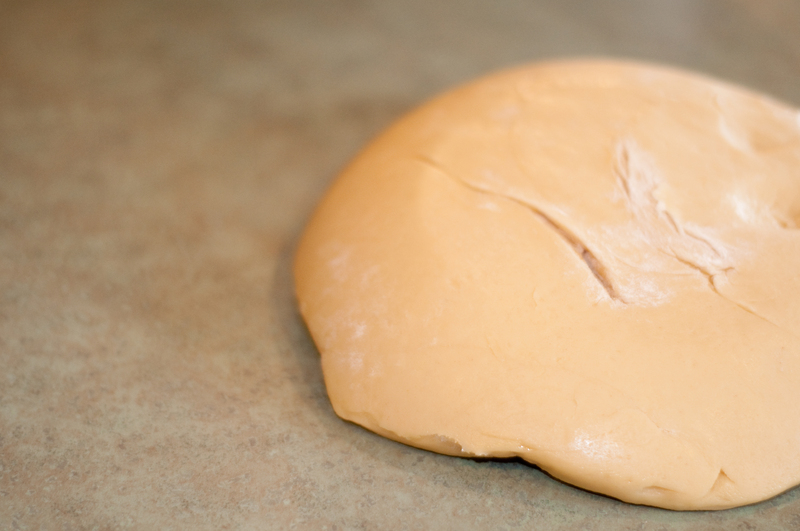 Empty the dough onto a floured surface, and knead with your hands a few more minutes, or until the dough is smooth and elastic. 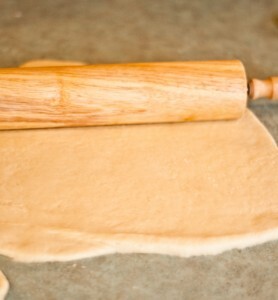 Roll out your dough to about a half inch thickness. 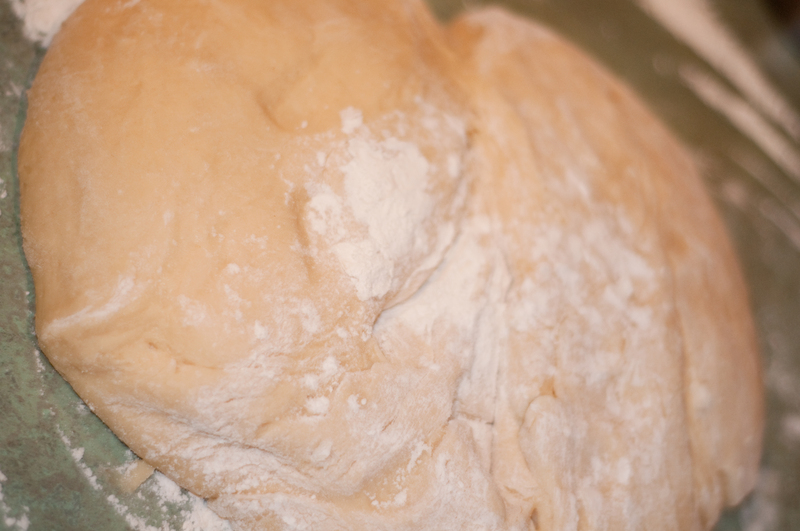 (Don’t roll the dough out too thick, or your doughnuts won’t cook all the way through.) You’ll want to roll them out on a floured surface, so they are easy to handle. I do not have a fancy doughnut cutter, so if you do not have one, don’t panic! I used a biscuit cutter to cut circles of dough. To cut the hole, I took the lid off of a 2 liter bottle of soda! It worked perfectly! Don’t forget to save the holes! Heat vegetable oil in an electric frying pan. Make sure your oil is nice and hot. (Flick a droplet of water onto the oil to test it. If the water “dances” , your oil is ready!) Drop a few doughnuts at a time into the hot oil. You may want to try just one or two at first, until you get a handle on the cooking time. The doughnuts will cook quickly. 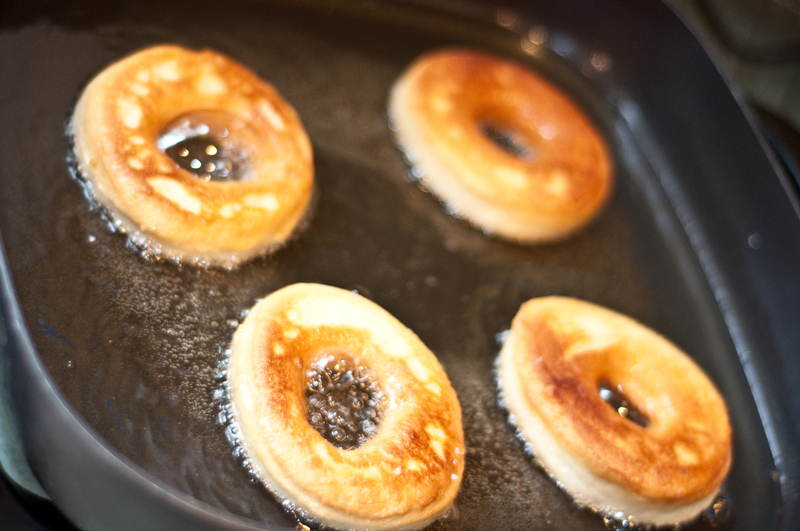 After the doughnuts have been in the oil for about 90 seconds, check to see if they are golden brown, and then flip. (Exact cooking time will depend on your individual pan and temperature of the oil.) Towards the end of my cooking, my doughnuts were taking a bit longer to cook. Just keep a watchful eye. The doughnuts will puff up a bit as they cook, and will be a light golden brown on both sides when finished cooking. 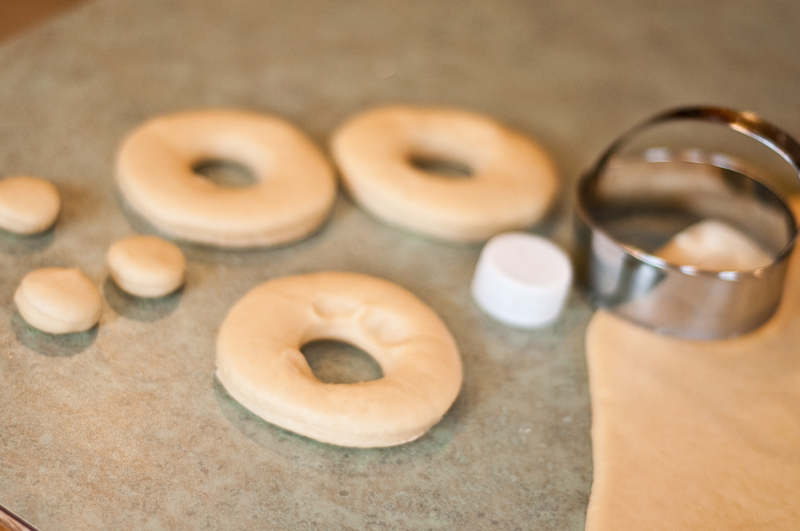 Lay the finished doughnuts on a tray lined with paper towels to cool and dry. Now comes the hard part…Try to prevent yourself from eating all of them by yourself. These doughnuts are seriously amazing. These doughnuts are delicious plain, but you could top them with a variety of things. 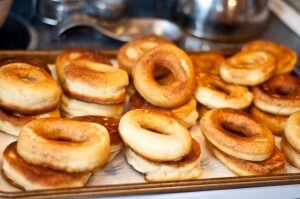 Place a few doughnuts into a paper bag filled with powdered sugar, or cinnamon sugar, and shake well. You could make a simple glaze and have your own “Krispy Kreme” style doughnuts. Top with a chocolate frosting, or check out the Pioneer Woman’s maple icing (in her first cookbook!) Don’t forget to fry up your doughnut holes! Trust me, if you are thinking that homemade doughnuts are impossible, think again! Try it out, and have some of the best doughnuts you’ll ever taste in just a few hours! Think I’ll go have another myself…. These look fantastic! Now I’m hungry. Oh man, those DO look yummy!!! Too much for 2 people? I was trying to figure out when to make them so nobody else is around. Want them all to myself! That is a mama’s job right to test out the food first make sure it doesn’t kill anyone?